WARNING: SPOILERS FOLLOW! NO, SERIOUSLY, IF YOU READ ALL OF THIS, AND HAVEN’T SEEN THE MOVIE YET, AND DON’T WANT SPOILERS, THEN DON’T COME CRYING TO ME, BECAUSE I WARNED YOU. Over the course of the last decade, Marvel Studios has set the bar exceptionally high for acting in superhero movies. 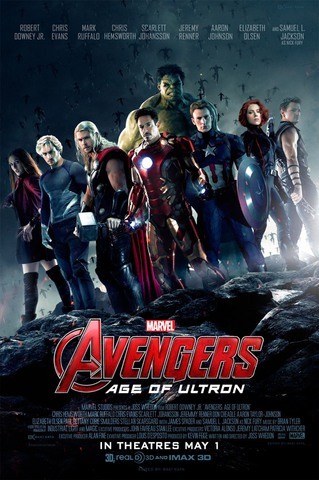 And Avengers: Age of Ultron is no different. What’s astonishing about the Avengers films is that they can have such a large ensemble of protagonists who give better performances and leave more lasting impressions than half the large ensembles of “awards fodder” films. They each have excellent comedic timing with their quirky quips, and yet perfectly embody the more serious and emotional moments of the film. James Spader as the voice of Ultron was perfection. And Elizabeth Olsen is a superb actor, far surpassing anything her sisters could have ever hoped to accomplish. Also, Aaron Taylor-Johnson is beautiful, and also an excellent actor. Joss Whedon is a masterful screenwriter. He knows what works and what doesn’t, capitalising on what does and accepting what doesn’t. Joss might just be the only male screenwriter who writes intricately complex and strong female characters, which is why I was so put off by the out-of-place love story between Natasha Romanoff (Black Widow) and Bruce Banner (Hulk). Now, I will admit that I haven’t ever read the comic books, however, I have it on good authority that Black Widow’s character in this film was much more akin to her character in the comic books than has been seen in previous films. But the reason I was put off by the romance was because it made me feel like Nat was suddenly relying on a man to make her feel whole, and that everything that was woven in the previous films to show that her character was just as tough – if not tougher – than her male counterparts was undone. And that was especially prevalent when she got all dewy eyed when she revealed to Bruce that she couldn’t have children. I’m not saying that wanting children is a bad thing, but the way it was executed in the film just made me feel like all she ever wanted was to be a dutiful housewife with kids. The little scene where everyone tried to pickup Thor’s hammer and failed was hilarious. And then later when Vision picked it up and handed it to Thor in front of everyone… that was perfection. With the inclusion of Wanda Maximoff/Scarlet Witch (Elizabeth Olsen) and a slightly larger role for Cobie Smulders’s Agent Hill, round two of the Avengers is slightly more diverse, but none of the three main female characters ever have a conversation together. Even when they’re in the same room together, Wanda and Nat never say a word to each other. Nor does Nat exchange any words with Agent Hill. For the most part, the visual effects were outstanding. However, the very opening sequence had me cringing. The opening fight sequence was so heavily CGI that it appeared to be an unfinished scene. It was painfully obvious that every single person on the screen was computer generated, and parts of the sequence were really choppy as though they were missing a few frames. There was also something different about Hulk that seemed off. They changed his face to make it look more like Mark Ruffalo’s, but that’s not what I’m talking about. I can’t quite put my finger on it, but it was like he was almost too detailed. There were also parts with Ultron where he moved much more organically than I thought he should. Yes, he’s an AI, but he’s an AI with a very mechanical body, so he should have moved more mechanically. Loved it. Just. Loved it. Everything about this was perfect. The music just really set the tone and was epic and awesome! I mean, who couldn’t love the costumes??!?! I mean… I hate Thor’s hair, but that’s just because I’m not into guys with long hair. The only real issue that I took with the story was that Ultron was immediately evil. I wanted to see a bit more buildup: he’s created, he helps the Avengers on a couple of missions, during those missions he comes to the conclusion that the only way to save humanity is to destroy it, and then he’s evil. But he was created and then was automatically evil. I understand that they only had so much time to fill, and I’m sure Joss didn’t want to make it too long as to be exhaustive, but it just happened so quickly. I love how Joss gave those indications throughout that Hawkeye wasn’t going to make it to the end, setting up the scene where he was going to die saving a little kid, but then Quicksilver bolts in and sacrifices himself. BAM! Joss Whedon, you terrible, awful jerk! I wish I knew how to quit you! But I don’t because, I love you! Everything just moved so fast, I wish it was longer!!! I WANT IT TO NEVER END!!!!! I mean… it’s a superhero movie. It’s meant be grandiose, so it’s not fair to rate it as such.